Ads.txt, a simple text-based file designed to rid of spoofers has a loophole and fraudsters are already capitalizing on it. ‘Behavioral advertising’ has become the principal target of the GDPR. For Facebook, it’s just a matter of time to get sued by any of the 28 EU regulators. Considering that the social network captures more than 20% of the total ad spend, there’s a reason to be concerned. Facebook shows ads to more than half of the internet population based on their online behavior. 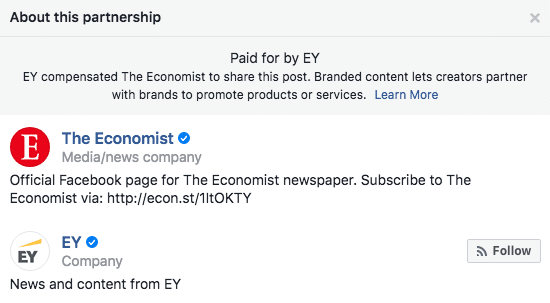 After a year of privacy crackdown, the social media giant introduced a (transparent) way to let users know why the ads are being shown to them. Chances are you’ve been delivered an ad which doesn’t seem relevant to you (at the moment). 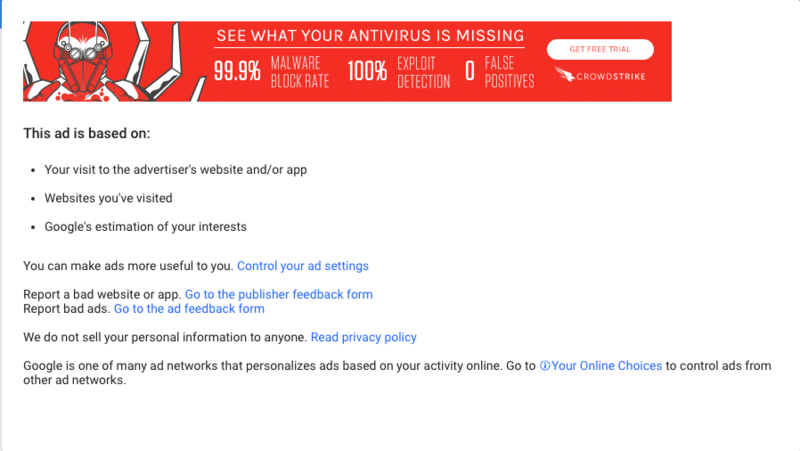 When you click on why this ad, you’ll be taken to a page where Google or other ad service provider will list you the reasons why you’re seeing a particular ad. Facebook recently improved the way it does the same. When you click on ‘i’ to see more about the ad, the company previously revealed who’s been running the ads. 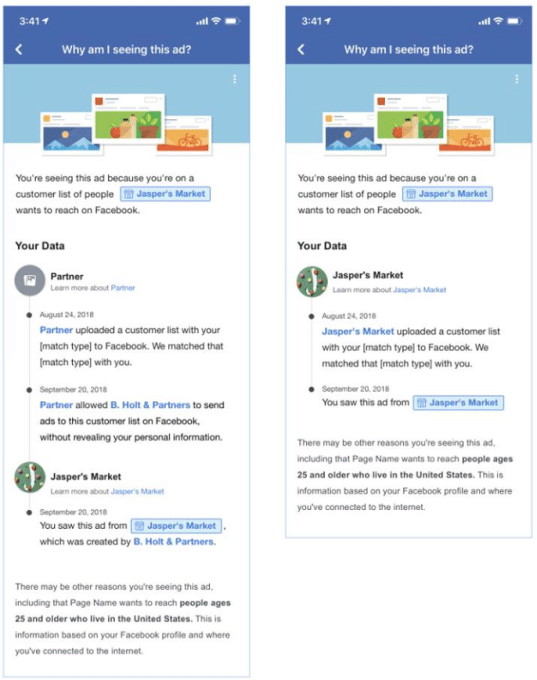 But starting from February 28th, Facebook will show who obtained your contact info (in case of contacts list based targeting) and also the brand using it to run ads. As we mentioned earlier, it’s time for the adtech companies or who depend on behavioral advertising to be proactive. German regulators just ruled that Facebook shouldn’t obtain information from the open internet to strengthen the user’s profile on its own platform. Google has been fined, and IAB Tech Lab has been criticized (along with Google) for the ad grouping. We need to analyze and try to patch up as many holes as possible. Every ruling will invoke more regulators to do the same. Retailers are always cautious when it comes to their de facto rival, Amazon. Despite pulling in millions of sales from brick-and-mortar stores, the company works hard to develop a herculean ad business. And, to be frank, it’s winning. Analysts predict that Amazon’s ad wing will surpass AWS by 2021. In order to beat the duopoly and continue its exponential growth rate, Amazon has to tempt a lucrative market – Retail (Expected digital advertising spend in the US, this year ≈ $28 billion). But we know Amazon. Don’t we. It has the habit of listening and reverting to the industry needs as quickly as possible. For instance, it recently introduced a brand new metric “New-to-brand” where a brand can know how many new customers they’ve acquired from the Amazon ad campaign. Surprisingly, a new study by Nanigans shows that the retailers are already convinced to spend more on Amazon. 1 of 3 marketers is shifting ad spend from Facebook and Google to Amazon. 29% are shifting dollars from Google and 34% are shifting dollars from Facebook and/or Instagram. 41% of retail marketers are adding new incremental spend with Amazon. – Ryan Kelly, vice president of marketing at Nanigans. – Strong and consistent ROI. Millions come to Amazon to buy and right ads at the right moment tend to convert well. – Membership data. As the marketplace has more than 100 million prime members and shopping data, it has an advantage. – Actual customers, not just potential. Unsurprisingly, Amazon has customers of retail companies. It’s hard to compete against the marketplace. However, there’s a clue how to stay relevant in the midst of walled gardens. Build what your industry (businesses) wants and they’ll eventually end up spending on your platform. That’s why niche publishers have higher chances of closing PG deals than generic news sites. Niche publishers built something that is relevant to one industry, not all. Besides, Wayfair is also into the game with the launch of Sponsored Ads. Don’t get left behind. According to the WSJ, fraudsters have spoofed domains and sold their bot impressions to advertisers. Double Verify stated that it stopped the scheme quickly, saving us $70 million to $80 million. First, the fraudsters crawled and copied the legitimate sites and created spoofed versions. Then, they used a botnet to mimic human behavior on the site and here comes the important part – They somehow got into the resellers’ network of legitimate publishers with the help of intermediaries. The spoofers checked the publishers’ ads.txt files to identify the resellers they partner with. And they signed up to those authorized sellers and resellers with the help of intermediaries. As buyers only check whether the seller is authorized to sell the publisher’s inventory, they’ll end up buying spoofed impressions. Ads.txt is no panacea. It comes down to the players in the system – sellers, SSPs, exchanges, DSPs to make sure they’ve optimized the transaction path to the maximum level. Ideally, a buyer should buy a premium inventory in 2 to 3 hops. DSP to Ad Exchange to SSP. Supply path optimization and keeping the ads.txt file sensible would prevent spoofers from siphoning the ad dollars using this technique. Also, ad exchanges should partner with ad networks and SSPs who’ve verified the domains. Speaking of SPO, we just got an interesting example to share. PubMatic, an ad exchange, and Goodway Group inked a deal to help each other out. The deal is simple. Goodway Group will ramp up its spending on PubMatic and the exchange, in return, will reduce the fee it charges. Both parties believe so. Header bidding, arguably the best way for any media buyers to have shot at premium ad impressions, increased the channels a buyer could use to get to the publisher’s inventory. In order to reduce the fee marketers are being charged, Goodway Group created a new low-tech fee supply path with PubMatic. With the new deal in place, Goodway will instruct its DSP to bid higher on PubMatic enabling the exchange to win more. – PubMatic should make sure the supply is premium and good enough to get the ROI for advertisers (coming through the DSP). – Goodway Group should found an ideal line to bid so that it wouldn’t spend too much neutralizing the low-tech fee negotiated. If the technique expands, adtech consolidation will increase its current pace and tons of middlemen will be pushed out of the ecosystem. What’s the roadblock? We’re too big to adapt to the strategy. It’ll take time and a lot of efforts to make this happen. We suggest you to partner with the right SSPs, thus, indirectly receiving the benefits. Eric Wheeler, CEO of 33Across explains the impacts of the economic downturn on adtech – AdExchanger. Connecting TV and digital, how Bloomberg created technology to link its linear TV and digital ad inventory – Digiday.